The New York Times best-selling author, historian and journalist Evan Thomas will join Judge Jennifer Walker Elrod of the Fifth U.S. Circuit Court of Appeals to discuss Thomas’ biography “First: Sandra Day O’Connor” on Tuesday, March 26, at Baylor Law School. WACO, Texas (March 25, 2019) – The New York Times best-selling author, historian and journalist Evan Thomas will join Judge Jennifer Walker Elrod of the Fifth U.S. Circuit Court of Appeals to discuss Thomas’ biography “First: Sandra Day O’Connor” on Tuesday, March 26, at Baylor Law School. Elrod, a Baylor University Regent, will lead a Q&A with Thomas at 4 p.m. in room 127 at the Law School, 1114 S. University Parks. The event is free and open to the public, but RSVPs are required. When President Ronald Reagan appointed O’Connor as the first female justice to the U.S. Supreme Court in 1981, she began a pioneering quarter-century on the bench, hearing cases that ultimately advanced and defined American law. Thomas’ biography draws on exclusive interviews and first-time access to O’Connor’s personal archives. The Law School conversation will focus on O’Connor’s life, career and the book. “As an inspiration figure in the legal profession for decades, our hope is that law students and lawyers look to her example of courage and determination to make a positive impact on our country,” Rispoli said. 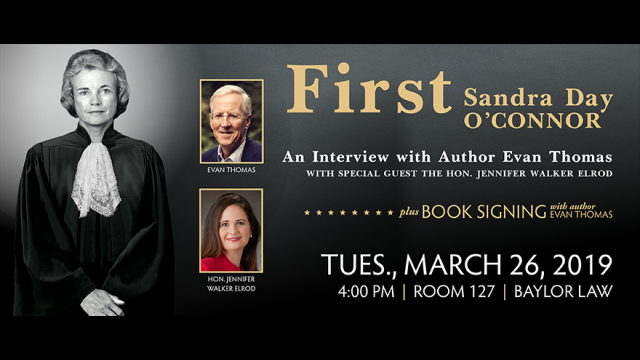 A book signing of “First: Sandra Day O’Connor” will follow the event, and it is free and open to the public. For more information or to RSVP online, click here. Established in 1857, Baylor Law was one of the first law schools in Texas and one of the first west of the Mississippi River. Today, the school has more than 7,500 living alumni. Accredited by the American Bar Association and a member of the Association of American Law Schools, Baylor Law has a record of producing outstanding lawyers, many of whom decide upon a career in public service. Baylor Law boasts among its notable alumni two governors, members or former members of the U.S. House of Representatives and the U.S. Senate, two former directors of the FBI, U.S. ambassadors, federal judges, justices of the Texas Supreme Court and members of the Texas Legislature. In its law specialties rankings, U.S. News & World Report ranked Baylor Law’s trial advocacy program as one of the top 5 in the nation. Baylor Law School also is ranked No. 50 in the magazine’s 2019 edition of “America’s Best Graduate Schools.” The National Jurist ranks Baylor Law as one of the “Best School for Practical Training” and No. 4 in the nation in its most recent “Best Law School Facilities” listing. Business Insider places Baylor Law among the top 50 law schools in the nation. Baylor Law School received the 2015 American Bar Association Pro Bono Publico Award, making it only the third law school in the nation to be honored with the award since its inception in 1984. Learn more at baylor.edu/law.